-Check out more CNN Polls at the CNN Polling Center. And this should surprise someone or anyone for that matter? Much of Romney's rhetoric has been focused on that. Think about the words that he has been saying; cutting taxes on everyone and not talking about counting capital gains as regular income as it should be. There is nothing new in these polls. We all know a vote for Romney is a vote for WALL STREET. Mitt Romney defined what "severely conservative" means. 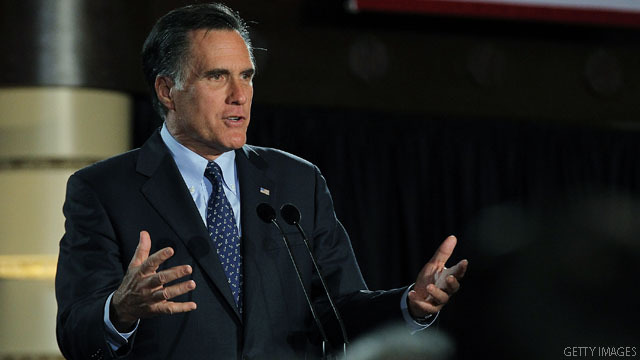 Save the middle class – keep Romney out of the white house. mitt you are done because you don't stand for anything and you tell peoples what they want to hear. What do MRs Tax Returns & Bigfoot have in common? Please release your tax returns, Mr. Romney. If the American people can't see who mitts stands for, then if he wins, you get what you asked for. Show the American People your tax returns for the last 20 years Willard. Then we'll see how "unfair" your 13% (so YOU say) tax rate really is. EVERYBODY favors the rich and wants to be among them. Nobody favors the poor. We all want the middle class to do better than they are right now (unless you're a member of the ultra rich). But what about the gas prices? Now I wonder why all of these folks have that view of Mitt ? My tax rate is 28%, and Mittens pays 13.9%, while making 30 times what I make. He is a lying out of touch birther. 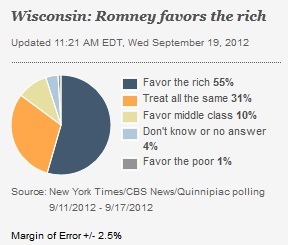 I'll bet you $10,000 the Romney campaign will dismiss this poll with their standard talking points. Ryan/Romney -- lying for votes. Wonder how much money Romney was paid to throw the election. Yep, Romney is (thankfully) screwed. I think Romney is out of touch with himself. The whole campaign is unraveling. I'm loving every second of it! Truth is a beautiful thing. It's not all that often that perception is reinforced by naked truth so perfectly.